This wedding photograph was taken at another of Long Island’s Gold Coast mansions: Mill Neck Manor in Mill Neck, NY. The north shore of Long Island, New York is home to many wonderful estates and mansions. Some of the others include The deSeversky Conference Center on the grounds of the New York Institute of Technology campus, Oheka Castle near the Nassau County border in the town of Huntington, The Glen Cove Mansion in Glen Cove, Coe Hall at Planting Fields Arboretum in Oyster Bay, The mansion at Old Westbury Gardens and The Royalton at Roslyn Country Club. I have had the pleasure of creating amazing wedding photographs at all of these elegant venues. This wedding took place on a blustery early winter day. 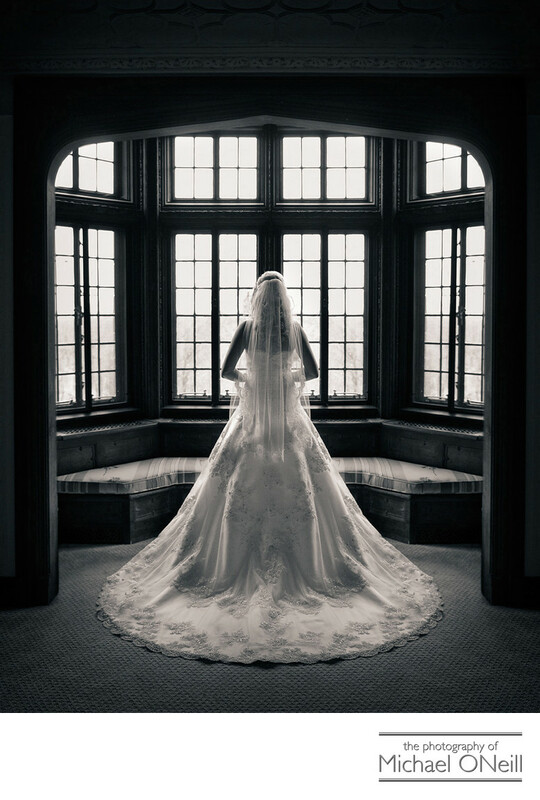 The bride and groom braved the cold weather and took some photographs on the grounds around the mansion before seeking refuge in the warmth of the mansion’s interior. I spotted this wonderful sitting area and posed the bride in front of the bay window which overlooks the mansion’s gardens. This image has garnered numerous awards in various professional photography competitions, including a silver award Accolade of Excellence in the WPPI (Wedding and Portrait Photographers International) 16 X 20 print, album and filmmaking competition held annually in Las Vegas, Nevada.